Woo hoo! 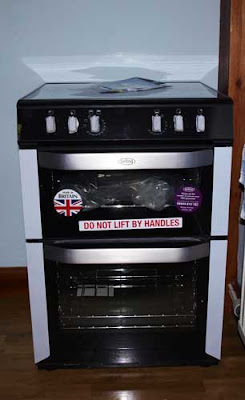 My new cooker (stove) arrived today, I can't use it yet because I don't want it to get covered in plaster dust when the kitchen wall comes down, so it's sitting in the dining room looking shiny and new. It seems smaller than the old one, but DH has been out with the measuring tape and the oven is actually bigger. I expect technology has moved on somewhat in 25 years! Work should start on the kitchen in a couple of weeks, I'll keep you posted. Lovely Janice! Bet you can't wait to use it! Cracking new cooker....Have fun with it. Oooh, shiny new gadget! Hope it enjoys its period of rest in dining room before you start putting it through its paces! That looks a beauty. Hope you don't have to wait too long to use it. I've got a Stoves cooker. Look forward to seeing your culinary creations Janice. Just think of the chocolate cakes you can make in that baby! There is nothing quite like receiving a new cooker - especially as it doesn't happen very often! I am now clearing up and reorganising my kitchen having just taken a wall down too. I has been really exciting to create a new space but oh, the mess! Don't underestimate the whiley powers of brick dust, it gets everywhere. Even though we screened off every other room downstairs and upstairs I have been astounded at the places the dust has settled. But it was worth it, and I am sure yours will be great, especially with your new oven to enjoy too!